We couldn’t think of a better way to celebrate the 10th year of the Work to Play program than to bring over 700 2nd, 3rd and 4th graders together for a day of soccer, fun and friendship. Kids and families from 24 Chicago Public Schools across 20 different Chicago communities all arrived bright and early on Saturday June 8th at the Midway Plaisance in Hyde Park. What began with co-founder and Executive Director Jim Dower gathering a group of boys and girls in Cabrini Green in the mornings before school started developed into Urban Initiatives flagship program that promotes health and wellness through the beautiful game of soccer. Urban Initiatives staff and over 140 volunteers all gathered even earlier to set-up and go through the game plan of giving these kids the time of their lives. Led by Coach Tom and some generously donated Starbucks coffee, volunteer’s set-up soccer stations for the UI soccer players and recess game stations for everyone to enjoy. 18 small-sided soccer fields played host to sweet spot passes, a few Messi’s and a whole lot of High Fives. The round robin tournament featured seven player teams, which allowed every UI kid to play soccer and more importantly share the skills and lessons on Teamwork. Very supportive parents, teachers and other school staff filled the sidelines as they cheered on the UI players. They shouted loudly for passes, goals and got even louder when players helped each other up after taking a tumble as they chased the ball. My grandson was so excited to come out and play with all the kids today, its great to see everyone come out to just have fun.” said Maceo Sr. grandparent of Maceo Jr. from Providence Englewood Charter School about the event. Once the players completed the soccer portion and had a whole lot of fun at the recess stations, they were treated to some healthy and delicious lunches. Preferred Meal Systems donated 1,200 tasty boxed lunches that featured a sandwich, fresh carrots, applesauce, graham crackers and a banana. While the kids ate their lunches, families headed over to the Snack Station where they enjoyed Quaker Chewy Yogurt Bars, Aquafina bottled water, Cliff Bars and a great variety of Lays potato chips. They also took home packets of Justin’s Organic Nut Butter to compliment their favorite healthy snack at home. Once each team went though the soccer, recess and lunch stations, everyone gathered for the award presentation. Coach Tom presented each school with a very special award that celebrated all the hard work each member of the Work to Play team put in throughout the school year. From mastering the Messi, to showing Heart, Hustle and Muscle each day, every team was recognized for their commitment to their teammates, the soccer team and most importantly their schoolwork. Our team was very excited to receive the For the Love of the Game award. ”It feels great for the team to be recognized for their dedication to the Work to Play program.” said Coach Laughlin the On-Site Program Director at Dr. Jorge Prieto Math and Science Academy. The final award of the afternoon was the M.V.P. award. The Most Valuable Partner award was presented to the J.R. Albert Foundation for their amazing support of Urban Initiatives and the Work to Play program over the past six years. Their funding has helped the Work to Play program become what it is today. 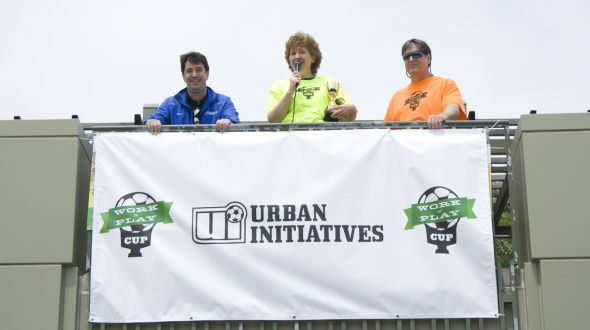 Urban Initiatives would like to thank all our amazing Work to Play Cup Team Sponsors: Storck, First Merit, YAPMO, Nuline Concepts, Silver Point Capital, Altair Advisers, Kirkland & Ellis LLP, AccessAlpha Worldwide, Stanley’s Fresh Produce, UI Student Board along with the Armstrong, Cole, Croke, Dammrich, Friedli, Girgenti, Hilpuesch, Hirshman, McGranahan, Redd, Reichert, Ricketts and Rodman Families. Thank you to our In-Kind Work to Play Cup sponsors: Preferred Meal Systems, Quaker, InnerWorkings and Justin’s. Thank you to the Chicago Park District, Midway Plaisance, Alderman Hairston and the 5th Ward. Thanks also goes out to all our great volunteers that spent their Saturday with our kids, the families and friends that came out to show support, and all of our Work to Play school principals and teachers that have welcomed Urban Initiatives into their school and classroom since day one. Thank you to Trish, Mike and Kelsey and all members of the J.R. Albert Foundation for their continued support. We hope to see you all next year for the 2nd annual Work to Play Cup! You can see plenty of more photos from the Work to Play Cup HERE. Previous Article: Daley Gets Dunked at Field Day!